Aayla Secura is a chromium only character in Star Wars: Galaxy of Heroes, who has always been considered useful, though not really meta. With the protection patch and the ability to reach her gear max of level 10 with only a fusion furnace, Aayla has, at least temporarily crossed the line into meta territory. If your DPS consists mainly of Leia then Gear 10 Aayla is a suitable replacement for the Gear 9 Royal Guard. Although Aayla has 2k less HP (and no taunt), she brings into the mix better damage, slightly better speed, self healing (easily making up the HP difference), retaliate, and a stun that’s nearly as reliable as the RG. Oh yes, lets not forget the assist calls. In short, by giving up taunt you gain substantially more DPS and a little more survivability. Our Aayla Secura in Star Wars: Galaxy of Heroes is fully maxed (without Omegas) save for her leadership ability at level 3 which is useful only in Jedi teams. To show off Aayla’s ability, we mirrored the #2 team on our server. 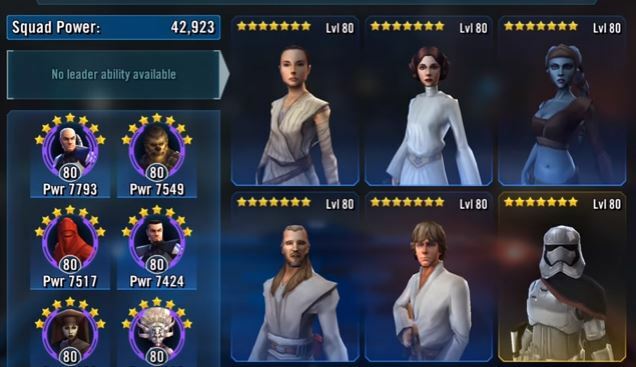 Here is the control video showing an auto battle with the exact same team configs (and without Aayla). In the Arena1 battle you’ll see we fared somewhat better by replacing RG with Aayla in both battles. In the Arena2 battle’s we’re lucky enough to see a defensive Aayla! Arena3 was a somewhat weak team so we only recorded one battle. As you can see, Aayla certainly has a place in the current meta. However as more attackers get past their gear blocks and gear 10 RG’s start to show up, expect Aayla’s time on meta center stage to fall off quickly. Once you have a gear 10 Rey ready to start clobbering time, RG becomes a much more obvious choice since Aayla would let the enemy team easily take out your Rey (something the AI doesn’t do in these videos). In Raids Aayla shines in phase 1 as additional crowd control while also bringing in decent DPS into the mix. On the Rancor itself Aayla has some use in D & E teams, but her kit doesn’t bring all that much utility to the rancor fight and in most cases you’re better off with a solid DPS character. We don’t have a phase1 video available to show you but here’s a P3 fight where she took a spot on our E team so you can see how her utility and DPS stacks up. Aayla Secura in Star Wars: Galaxy of Heroes is a versatile attacker with high survivability through Dodge, Hitpoints, and self healing. Although we said we wasn’t going to show challenges any more we had made a video of Aayla before we made that decision. Additionally since we are doing a review of Cad after we finish this review we made an additional healer challenge video and while meant to show off Cad, it does show off Aayla in the healer challenge where she certainly does shine. The healer challenge is not the max tier since we’re leveling some under-geared toons and needed the blue droid callers. Aayla has always been a useful jack of all trades character and once she reaches Gear 10 she becomes one of the most powerful characters in the game. Right now she is arena meta if your only DPS attacker is Leia. If this is the case she can replace a gear 9 Royal Guard. Do expect her time in the meta spotlight to be limited however as newly geared attackers start needing Royal Guard’s protection and as Royal Guard himself gets to gear 10. In raids, Aayla is very useful on P1 bringing an additional, somewhat reliable stun and solid DPS to the fight. On other phases her kit brings less utility to the fight though she is still a good DPS choice and her self healing can be very helpful from time to time. On the healer challenge, Aayla will help ensure savage is never able to attack your team. You will love her. Thanks to user The Consulars for creating this review for Aayla Secura. What do you think of Aayla Secura in Star Wars: Galaxy of Heroes? Is he good or bad? Do you have any suggestions or feedback? Please feel free to leave a comment below. Be the first to comment on "Aayla Secura Review – Star Wars: Galaxy of Heroes"